Does a Smartphone Charger Stop After It's Full? When Charging Batteries Should They Make a Boiling Noise? How did you hold up during last week's record-setting polar vortex? If you were in the midwest – like Chicago, where wind chill temperatures dipped to -52 degrees Fahrenheit – we hope you stayed warm and safe inside. It's no secret that extreme cold temperatures pose a health risk: You know, frostbite and hypothermia. But if you head out when it's even "regular" cold, you might notice your phone charge suddenly goes MIA. We're talking a battery life that runs down way too fast – or a phone that just shuts off even if you've got plenty of battery charge left. So why does your phone suddenly stop working in cold weather? It has to do with the battery. Read on to find out what's happening – and how you can keep your phone alive all winter long. Virtually every smartphone out now uses the same type of battery: a lithium ion battery, sometimes called Li-ion batteries. Li-ion batters have some huge advantages: they make it easy to charge your phone fast, which is why you can go from 20 percent to 80 percent charge in less than half an hour. And, unlike older batteries, they don't develop a "memory" that shortens your battery life. Older phone batteries shortened their battery life to adapt to your charging habits – so if you charged your phone twice a day (even if you didn't need to) the battery would adapt so you'd have to charge it twice a day to keep a charge. Li-ion batteries, on the other hand, can be charged when you want without creating a "memory" that harms your overall battery life. So clearly, Li-ion batteries have plenty of upsides. So Why Don't Li-Ion Batteries Work Well in the Cold? When the temperature drops, the internal resistance of your battery goes up. That means more of your battery's power is wasted – so your battery has to work harder just to keep your phone running. So you'll see the charge go down much faster than if you stayed inside. Another reason? One simple rule of chemistry: that when temperature goes down, the rate of most chemical reactions goes down, too. Li-ion batteries continually carry out a chemical reactions to generate energy (aka the power that keeps your phone running). When the temperature goes down, it can't carry out that chemical reaction as quickly. That means it can't generate as much power for your phone. In some cases, it won't generate enough power for your phone to carry out its basic functions – which is why your phone might suddenly shut off, even if it says you still have battery life left. Not surprisingly, the effects of cold weather on your phone get worse the colder it gets. As Wired reports, temperatures of -35 degrees Fahrenheit (like last week's polar vortex conditions) can kill your phone's battery in five minutes. 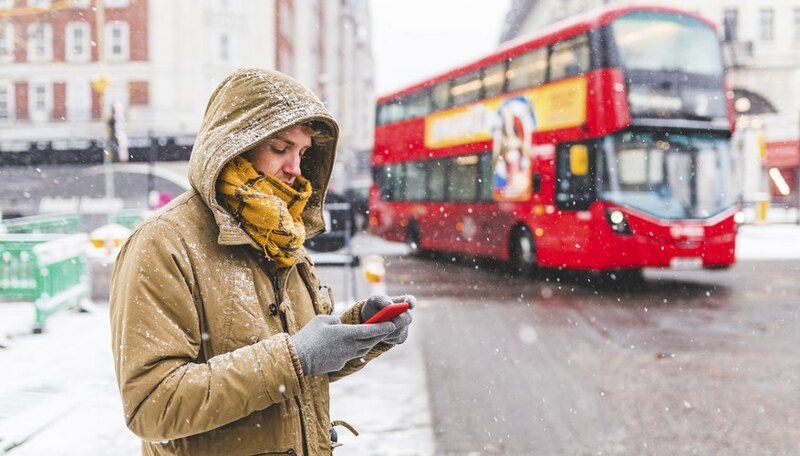 One option is obvious: Simply shut off your phone when you're out in arctic temperatures. While it may not not be convenient, powering off your phone makes the battery much more hardy to cold, so you'll still have a charge when you head back inside. If shutting your phone off is not an option, keep it in an internal pocket in your coat, so you'll keep it toasty with your body heat. And if you spend a lot of time outdoors and need a functional phone (say, for safety when skiing or winter hiking) invest in an insulating case to keep the heat in and the cold out. Most importantly, keep your phone on you: never leave it in a parked car outside where it'll be exposed to sub-zero temperatures for hours. You'll not only spare your battery, but avoid more expensive damage – like a frozen screen – to keep your phone happy all winter long. What Is a Safe GPU Temperature for a Laptop? Does Cold Make You Sleepy? What Is the Effect of Cold Temperatures on Magnets? Tremblay,, Sylvie. "Here's Why Your Phone Stops Working in the Cold." Sciencing, https://sciencing.com/heres-why-your-phone-stops-working-in-the-cold-13716908.html. 04 February 2019.